Six of the original Give Hope girls sign the official contract to bring Jen Bricker to Wawasee High School along with the teacher who has helped them to make this dream a reality. Pictured, from left, are Autumn Turner, Katelyn Bray, Claire Beer, Nyla White, Ella Beezley, Kristy Lin and Mary Brower, Milford Middle School teacher. SYRACUSE—After discussing how to make an impact through a community-based school project, seven Milford Middle School girls began Give Hope. These girls were challenged to recognize a need in the community and research ways to make a positive impact. Seeing others struggle with negativity and the hurdles of life, the girls chose to raise awareness to help anyone going through struggles to come out stronger and more positive. The mission of Give Hope is to positively encourage people to not allow the difficulties of life to hold them back. Give Hope’s goal was to bring Jen Bricker, an acrobat, aerialist and motivational speaker born without legs, to speak to the community. That dream has since become a reality. 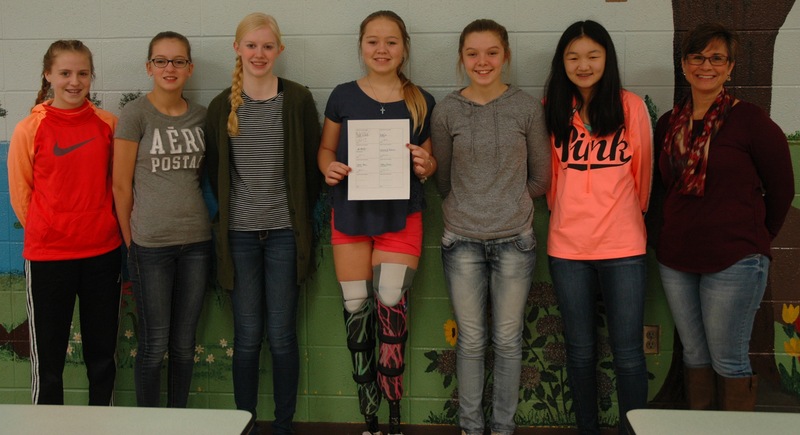 After spending two years raising the money, a total of more than $11,000, these now eighth grade girls are bringing Bricker to speak at Wawasee High School Wednesday, March 15. Bricker will present to Wawasee Community School Corp. fifth- through eighth-graders at 9:30 a.m. Wednesday, March 15. Students in ninth through 12th grade will have their presentation at 1 p.m.
All members of the community are invited to attend the 6:30 p.m. performance and presentation by Bricker in the Wawasee High School gymnasium.